There are nineteen species in Southern Africa, with only four in South Africa itself. Some recognize a fifth species, Lepisiota minuta, but others consider that this is merely a miniature form of L. capensis. It’s difficult to sustain this argument as the two ‘species’ are quite distinct and no intermediates have ever been found; perhaps DNA comparison may settle the matter – one day! All Lepisiota are small, the largest species having workers of about 3 mm, the smallest less than 1.5 mm. They are often reported as monomorphic, ie all the same size, but this is not so and even superficial examination reveals a size variation of up to 0.5 mm. That might seem an unimportantly small variation but at the scale we’re working at it’s a big difference, and another useful way of telling the genus apart from other small, black ants. All members of the genus are black, but often with paler legs and antennae. The latter feature makes them easy to confuse with some Technomyrmex species [see Dolichoderinae], but ... it’s time to pull out your mini-microscope. ALL Lepisiota have two blunt spines on the propodeum, or the last segment of the thorax. You just can’t see this feature without magnification, but fortunately macro-photographs often also reveal these lumpy protuberances. Two species have become invasive, i.e. developed ‘budding’ as a means to spread themselves. Lepisiota incisa (African small black ant) [still to be illustrated] is the slightly larger of the two, 2.5 to 3mm; it has a distinctly larger, sharply-toothed petiole ‘leaf’ which can be clearly seen under 60x magnification. L. capensis (Common small black ant) ranges in size from 2.25 to 2.75 mm. Both species run in trails. In natural veld they nest in the ground, but in human settlements they might be in walls, under floors, etc. etc. 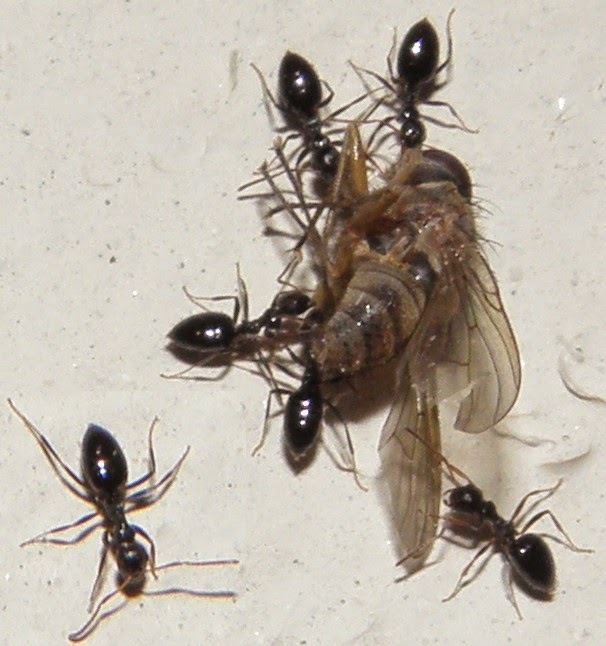 The ‘species’ in dispute are absolutely minute ants (Tiny black ants), hardly 1.5 mm in length, observed feeding in Carpobrotus flowers on the West Coast. This author is amongst those myrmecologists who feel that these are a different species, Lepisiota minuta.